StoneGuard® provides unparalleled countertop protection. 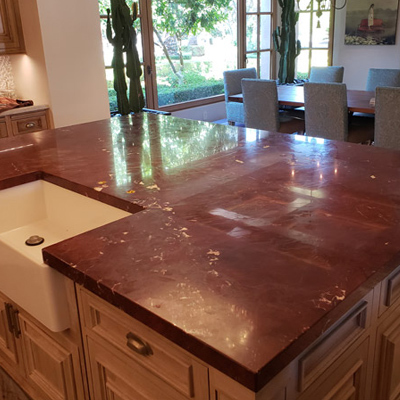 StoneGuard® is a polyethylene film applied to natural stone countertops and other surfaces, like conference tables and desks, bar tops, and more. Etches from acidic substances or improper cleaners, and Arizona’s harsh ultraviolet rays that can accelerate the etching process, can leave your once-pristine tops looking uninviting. Scratches, heat marks, chips, and dings take a toll, as well. StoneGuard® adds a new level of protection against such damage, as well as providing protection against the growth of bacteria. This island top was taken prior to our services. Notice the etching and dull appearance. In this image, the left side of the top has not been treated, but the right side has a StoneGuard® application. Here is the same top after our StoneGuard® services. What a difference! Coasters, placemats, table runners, liners, and the like are noticeable and often unwelcome solutions for stone protection. 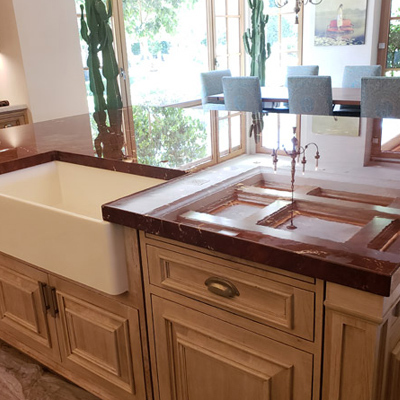 While they may keep your tops in decent condition, they also cover the beauty and elegance of the natural stone. StoneGuard® is very unobtrusive and actually enhances the appearance of your stone by increasing the gloss by a minimum of 300%. It is also available in a beautiful matte finish. Sealers must be continually reapplied and only provide minimal protection against acidic substances — they basically only buy you some time to quickly wipe up the spill. But what if you don’t notice the spill or don’t have time to immediately attend to it? StoneGuard® eliminates the need for sealing your stone, because it is highly resistant to acidic substances. 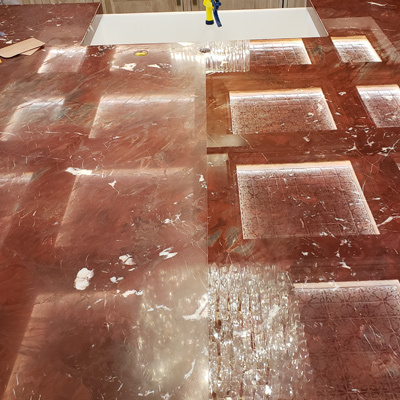 Normally, natural stone must be periodically serviced by a professional stone restoration contractor in order to hone and polish out scratches and damage, remove stains, and reapply sealer, but a StoneGuard®-protected top requires no such maintenance. Simply use a clean microfiber towel, StoneGuard® Surfectant cleaner, and warm water to wipe down your top. That’s it! Here are the answers to a few common questions about StoneGuard®. Of course, you can feel free to give us a call with any additional questions and more specific warranty information. Will the film get damaged over time? StoneGuard® is a consumable product that will see natural wear and tear over time. Follow care procedures on Maintenance Instructions to minimize damage and wear to the film. StoneGuard® is not permanent and can be removed. StoneGuard® comes with a 3 year Limited Warranty from bubbling and discoloration and a 15-year Performance Guarantee.